↑ Homa Katouzian, "State and Society in Iran: The Eclipse of the Qajars and the Emergence of the Pahlavis"، Published by I.B.Tauris, 2006. pg 327: "In post-Islamic times, the mother-tongue of Iran's rulers was often Turkic, but Persian was almost invariably the cultural and administrative language"
↑ Homa Katouzian, "Iranian history and politics"، Published by Routledge, 2003. pg 128: "Indeed, since the formation of the Ghaznavids state in the tenth century until the fall of Qajars at the beginning of the twentieth century, most parts of the Iranian cultural regions were ruled by Turkic-speaking dynasties most of the time. At the same time, the official language was Persian, the court literature was in Persian, and most of the chancellors, ministers, and mandarins were Persian speakers of the highest learning and ability"
↑ Jamie Stokes, Anthony Gorman, Encyclopedia of the Peoples of Africa and the Middle East, 2010, p.707, Online Edition، The Safavid and Qajar dynasties, rulers in Iran from 1501 to 1722 and from 1795 to 1925 respectively, were Turkic in origin. 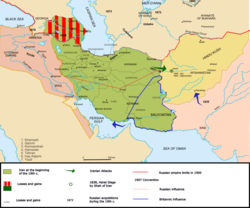 ↑ Abbas Amanat, The Pivot of the Universe: Nasir Al-Din Shah Qajar and the Iranian Monarchy, 1831–1896, I.B.Tauris, pp 2–3; "In the 126 years between the fall of the Safavid state in 1722 and the accession of Nasir al-Din Shah, the Qajars evolved from a shepherd-warrior tribe with strongholds in northern Iran into a Persian dynasty.۔"
↑ Choueiri, Youssef M.، A companion to the history of the Middle East، (Blackwell Ltd.، 2005)، 231,516. ↑ (1981) Muslim World. Brill Archive, 65, 370. ISBN 978-90-04-06196-5. Retrieved on 28 ستمبر 2012.